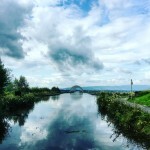 Guest blog post by Andrew Davidson, who recently raised money for children’s charity, Barnados by completing a 65 mile walk across the Lowland canal network. They say that life begins at 40. 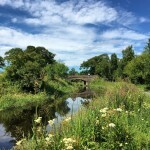 Well, my 40s began with a life-affirming 65-mile walk along the Forth & Clyde and Union Canals at the end of July. I wanted to mark this milestone with a memorable activity. 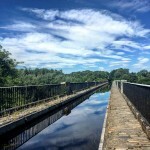 My love of canals, my Scottish heritage and wanting to celebrate my big birthday with family and friends in Auld Reekie meant that Glasgow to Edinburgh, stopping midway in Falkirk overnight, was the perfect route. And having trained for this walk on the South West Coastal Path in Cornwall, the Thames Estuary Path in Essex and along the Caledonian Canal in the Highlands, I have to say that is was also the perfect path! The work put into these canals to create the Millennium Link and the national cycle route means the path is of an extremely high standard. And because the Union is a contour canal, meaning it is on one level all the way with no locks, it must be a joy to cycle as well. But for me, walking is the best way to see the country properly, and at a slow pace. 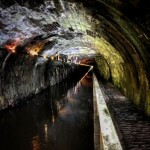 Although they’re often somewhat off the beaten track (and that can of course be part of their attraction), canals’ historic role in shaping our landscape and industrial heritage means that they provide unique insights into the past. Most striking are the extraordinary feats of engineering – from the flight of locks at Maryhill to the dizzying heights of the Almond Aqueduct near Ratho – all built by hand nearly two centuries ago. And the canals are also lined with interesting buildings. 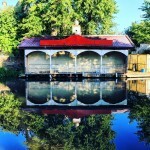 My favourite was an abandoned boathouse, reflected perfectly in the water near Hamilton Park in west Edinburgh. However, it’s not just the past on show, it’s the future. Where the Forth & Clyde meets the Union at Falkirk, heritage also meets cutting edge engineering in the shape of the Falkirk Wheel, the world’s first and only rotating boat lift, which has just celebrated its 15th birthday – a mere bairn! And bairns were on my mind during the walk, especially the harder-going parts, because I did it to raise money for a children’s charity. Barnardo’s do an amazing variety of work across the UK to create positive futures, stronger families and safer childhoods for young people. You can read more or donate by visiting https://www.justgiving.com/fundraising/andrewdavidson40walk.